The previous post ensured readers would always go with the trend and never go against the trend. After all, ‘The Trend is your Friend’. Meaning that if the trend is going up, we would not sell short to enter the trade but would buy into it; and if the trend was going down, we would not buy to enter the trade but would look for a short position. However, it there was no clear trend up or down and instead it was going sideways, we could both sell short at the top to enter the trade or buy at the bottom to enter the trade. Let us take a look at the example below. 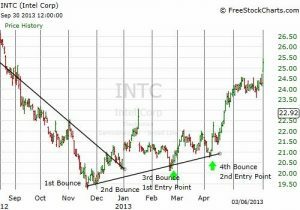 INTC (Intel) clearly has a downward trend from May. The highs are getting lower and the lows are getting lower. That means that we cannot buy the stock, as we have no idea when this downward trend is going to stop. As the saying goes “The trend is your friend”. But where do you get in? The answer is “the bend at the end”. 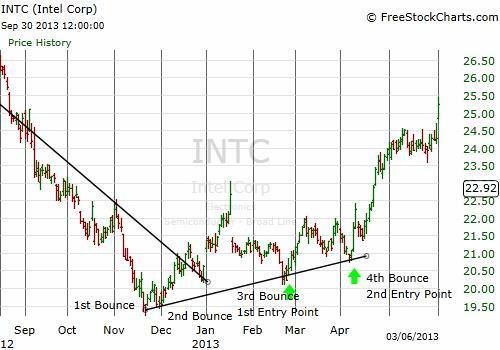 As you can see, in 2013, INTC suddenly changed direction and started to go up. The lowest point is below 19.60 late November, the ideal time to get in. As much as I would like to say that we could have timed the market perfectly, this is much easier said than done. The truth is we don’t know that the turn has occurred, until it has already occurred. As explained in an earlier month of WealthWatch, we are looking at 3 bounces to be sure that a new trend is in progress. The two bounces end November allow us to draw a line which then hits the low in February. This February bounce at around 20.30 is our 3rd bounce and the signal to get in using a ‘Stop’ order i.e. when it bounces back up. If we have missed this for any reason, the 4th bounce at around 21.00 is another chance to get in. Let us take a look at another example below. 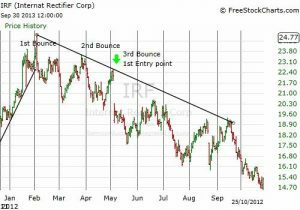 IRF was trending up in January, February and March. We feel that it has gone up a lot and will turn at some point but we cannot just simple sell short as we don’t know when it is going to turn. Suddenly it starts to change direction. The high was around 24.77, an ideal place to sell short, but we only know that with hindsight. We never know when the trend is going to end until it already has. The high of 24.77 is therefore our first bounce but it is not until the 2nd bounce in late March at just above 23.10, bringing with it a lower low and lower high that we think that trend might indeed have turned. But we need to be sure. We cannot start selling short until we get confirmation. The line connecting the first two bounces extends and is hit in May at 22.40. This is a chance for us to get in with a ‘stop’ order, which gets us in ONLY if the stock turns and goes back down. And this is indeed what happened (see chart below). It is almost as if everyone was waiting for the same entry point before entering. As soon as the 3rd bounce occurs, there is a sudden drop, leaving a Gap. A Gap is where the price closes at one point and opens the next day at a point so far away from the close price that a gap occurs on the chart. 10% and more are achieved in a day and the stock continues down for several months for approximately 33% gain. What does this tell us? It tells us that we don’t need to know exactly where the top is to be able to make money. This is just aswell, because no-one knows exactly where the top or the bottom is going to be until after it has occurred. If you see a stock heading in one direction, do not assume that it is going to turn and try to time the market and get in. You have no idea when or how long the trend is going to continue. Therefore, wait until we get confirmation that the trend is over. It is not enough that the stock starts to turn and go in the opposite direction but rather that it has established a new trend in the opposite direction.